The Nonprofit Sector in Brief 2015 uses the most recent data available to highlight significant trends in the nonprofit sector. Each year, The Nonprofit Sector in Brief presents key information on the number and finances of 501(c)3 public charities as well as findings regarding two critical resources for the sector: private charitable contributions and volunteering. This edition, updated for 2015, presents data from 2003 to 2013. Approximately 1.41 million nonprofits were registered with the Internal Revenue Service (IRS) in 2013, an increase of 2.8 percent from 2003. Of the nonprofit organizations registered with IRS, 501(c)(3) public charities accounted for just over three-quarters of the nonprofit sector’s revenue and expenses ($1.73 trillion and $1.62 trillion, respectively) and more than three-fifths of nonprofit assets ($3.22 trillion) in 2013. In 2014, total private giving from individuals, foundations, and businesses totaled $358.38 billion, an increase of just over 5 percent from 2013 after adjusting for inflation. According to Giving USA (2015), total charitable giving rose for the fifth consecutive year in 2014. After adjusting for inflation, this is the first year to exceed the previous peak set before the recession in 2007 ($355.16 billion in 2014 dollars). Fully 25.3 percent of US adults volunteered with an organization in 2014, contributing an estimated 8.7 billion hours, the most hours recorded since the Current Population Survey’s volunteer supplement began in 2002; the value of these hours is approximately $179.2 billion. From 2003 to 2013, the number of nonprofit organizations registered with the IRS rose from 1.38 million to 1.41 million, an increase of 2.8 percent. These 1.41 million organizations comprise a diverse range of nonprofits, including art, health, education, and advocacy nonprofits; labor unions; and business and professional associations. This broad spectrum, however, only includes registered nonprofit organizations; the total number of nonprofit organizations operating in the United States is unknown. Religious congregations and organizations with less than $50,000 in annual revenue are not required to register with the IRS, though many do.2 These unregistered organizations expand the scope of the nonprofit sector beyond the 1.41 million organizations this brief focuses on. Approximately 35 percent of nonprofits registered with the IRS in 2013 were required to file a Form 990, Form 990-EZ, or Form 990-PF with the IRS.3 These reporting nonprofits identified $2.26 trillion in revenues and $5.17 trillion in assets (table 1).4 Between 2003 and 2013, finances for reporting nonprofits showed healthy development. Both revenues and assets grew faster than GDP: after adjusting for inflation, revenues grew 30.7 percent and assets grew 32.7 percent, compared with 14.3 percent growth for GDP. Expenses grew 27.3 percent (after adjusting for inflation) during the same period. In the short term, after adjusting for inflation, revenues grew 3.0 percent from $2.19 trillion in 2012 to $2.26 trillion in 2013; assets increased 5.2 percent from $4.91 trillion to $5.17 trillion. Expenses also grew from $2.06 trillion in 2012 to $2.10 trillion in 2013, an increase of 1.7 percent. Public charities are the largest category of the more than 30 types of tax-exempt nonprofit organizations defined by the Internal Revenue Code. Classified under section 501(c)(3) (along with private foundations), public charities include arts, culture, and humanities organizations; education organizations; health care organizations; human services organizations; and other types of organizations to which donors can make tax-deductible donations. In 2013, over 950,000 organizations were classified as public charities, composing over two-thirds of all registered nonprofits. Between 2003 and 2013, the number of public charities grew 19.5 percent, faster than the growth of all registered nonprofits (2.8 percent). The number of registered public charities also grew faster than other nonprofit subgroups during the decade, including private foundations, which declined 8.3 percent, and 501(c)(4) organizations, which declined 0.32 percent. Consequently, public charities made up a larger share of the nonprofit sector in 2013 (67.5 percent) than in 2003 (58.1 percent). The number of reporting charities required to file a Form 990 or Form 990-EZ grew slightly between 2012 and 2013, showing an increase of 2.3 percent. For comparison, the number decreased slightly between 2011 and 2012 (less than 0.5 percent). 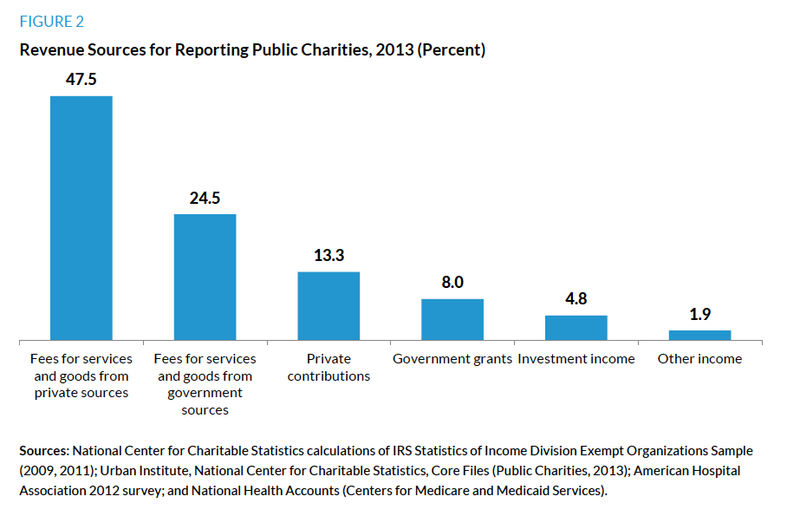 Fully 58.6 percent of nonprofit organizations reporting to the IRS in 2013 were public charities. Accounting for more than three-quarters of revenues and expenses for the nonprofit sector, public charities reported $1.73 trillion in revenues and $1.62 trillion in expenses. Assets held by public charities accounted for more than three-fifths of the sector’s total ($3.22 trillion). Even after excluding organizations with gross receipts below the $50,000 filing threshold, small organizations composed the majority of public charities in 2013. As shown in figure 1, 66.4 percent had less than $500,000 in expenses (194,749 organizations); they composed less than 2 percent of public charity expenditures ($30.1 billion). Though organizations with expenses at $10 million or more included just 5.3 percent of public charities (15,409 organizations), they accounted for 86.7 percent of public charity expenditures ($1.4 trillion). Almost half (47.5 percent) of the total revenue for public charities came from fees for services and goods from private sources (figure 2). This figure includes tuition payments, ticket sales, and hospital patient revenues (but excludes Medicare and Medicaid) and is driven largely by hospitals and higher-education nonprofits, both of which derive their funding primarily through fees for goods and services. The next-largest proportion of public charities’ revenue came from fees from government sources, such as government contracts and Medicare and Medicaid payments; these fees accounted for just under one-quarter of public charities’ revenues (24.5 percent) in 2013. Private charitable giving represented 13.3 percent of total revenues, and government grants represented another 8 percent. The remainder of revenue came from investment (4.8 percent) and other income (1.9 percent). Combining government contracts and grants into a single category, the government provided nearly one-third (32.5 percent) of 2013 nonprofit revenues. 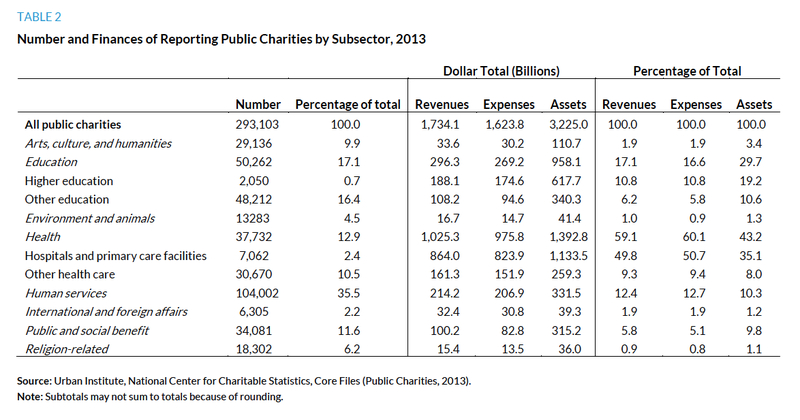 Table 2 displays the 2013 distribution of public charities by type of organization. Human services groups—such as food banks, homeless shelters, youth services, sports organizations, and family or legal services—composed over one-third of all public charities (35.5 percent). They were more than twice as numerous as education organizations, the next-most prolific type of organization, which accounted for 17.1 percent of all public charities. Education organizations include booster clubs, parent-teacher associations, parent-teacher organizations, and financial aid groups. Health care organizations, though accounting for only 12.9 percent of reporting public charities, accounted for nearly three-fifths of public charity revenues and expenses in 2013. Education organizations accounted for about 17.1 percent of revenues and 16.6 percent of expenses; human services organizations, despite being more numerous, accounted for comparatively less revenue (12.4 percent of the total) and expenses (12.7 percent of the total). Hospitals, despite composing only 2.4 percent of total public charities (just over 7,000 organizations), accounted for about half of all public charity revenues and expenses (49.8 and 50.7 percent, respectively). 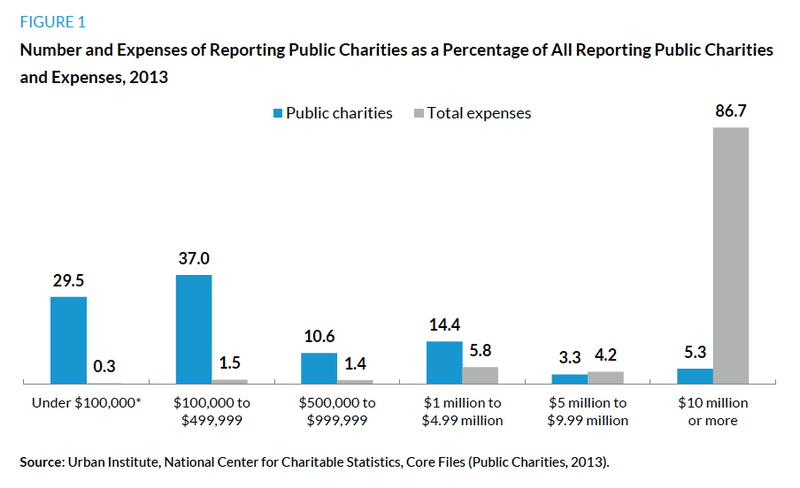 The number of reporting public charities in 2013 was approximately 2.3 percent higher than the number in 2012. 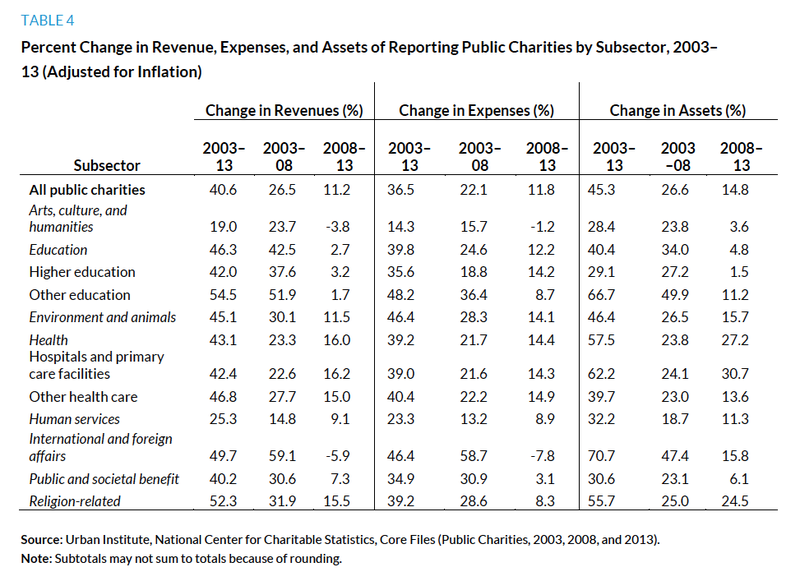 The total revenues, expenses, and assets for reporting public charities all increased between 2012 and 2013: after adjusting for inflation, revenues rose 3.5 percent, expenses rose 2.3 percent, and assets rose 6.2 percent. These trends are indicative of larger growth in the sector: both the number and finances of organizations in the nonprofit sector have grown over the past 10 years. But this growth has differed by subsector and period (table 3). Subsectors experienced varying degrees of financial expansion: although all subsectors reported increases in revenue in 2013 compared with 2003 (even after adjusting for inflation), a few subsectors decreased in number of nonprofits, including arts, education (excluding higher education), health (excluding hospitals and primary care facilities), and other public and societal benefit organizations. Consequently, these types of organizations accounted for a slightly lower proportion of the total sector in 2013 (49.5 percent) than they did in 2003 (51.4 percent). The smallest subsectors (international and foreign affairs organizations and environment and animals organizations) saw the largest growth rates in the number of organizations, increasing 19.3 and 18.2 percent, respectively, from 2003 to 2013. Financially, education organizations (excluding higher education) had the largest proportional increase in both revenue and expenses despite their slight reduction in numbers, growing from $70.0 billion in revenue in 2003 to $108.2 billion in 2013 after adjusting for inflation (a change of 54.5 percent). Organizations devoted to higher education also saw considerable growth, increasing 42.0 percent in revenue (from $132.5 billion in 2003 to $188.1 billion in 2013, after adjusting for inflation). International and foreign affairs organizations also experienced large increases in revenues (49.7 percent) and expenses (46.4 percent) after adjusting for inflation (table 4). Although health organizations experienced a slightly lower growth rate of 43.1 percent in the same period, revenues for the health subsector in inflation-adjusted dollars increased from $716.7 billion to over $1.03 trillion, by far the largest dollar growth of any subsector between 2003 and 2013. At just over $300 billion, the growth attributed to the health care subsector accounts for over two-thirds of the growth of the nonprofit sector as a whole ($500.9 billion) between 2003 and 2013. 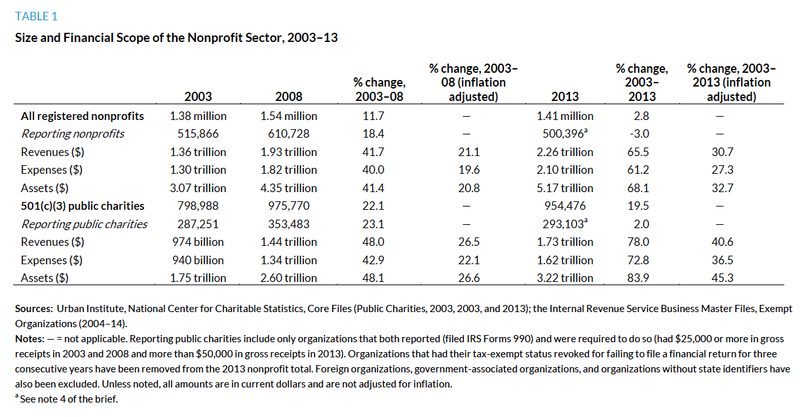 Public charities’ financial growth largely occurred before the recession (see table 4). From 2003 to 2008, revenues and assets for all public charities increased 26.5 percent and 26.6 percent, respectively, but both grew much more slowly during and after the recession from 2008 to 2013 (11.2 percent for revenues and 14.8 percent for assets, adjusting for inflation). Two subsectors actually experienced declining revenue between 2008 and 2013: international and foreign affairs organizations and arts, culture, and humanities organizations. International and foreign affairs organizations experienced larger decline, falling from $34.5 billion in revenue in 2008 to $32.4 billion in 2013 (a decline of 5.9 percent); arts, culture, and humanities organizations fell from $34.9 billion in revenue in 2008 to $33.6 billion in 2013 (a decline of 3.8 percent). Both subsectors also saw a decline in expenses (7.8 percent for international and foreign affairs organizations and 1.2 percent for arts, culture, and humanities organizations). However, all other subsectors experienced growth in both revenues and expenses (see table 4). 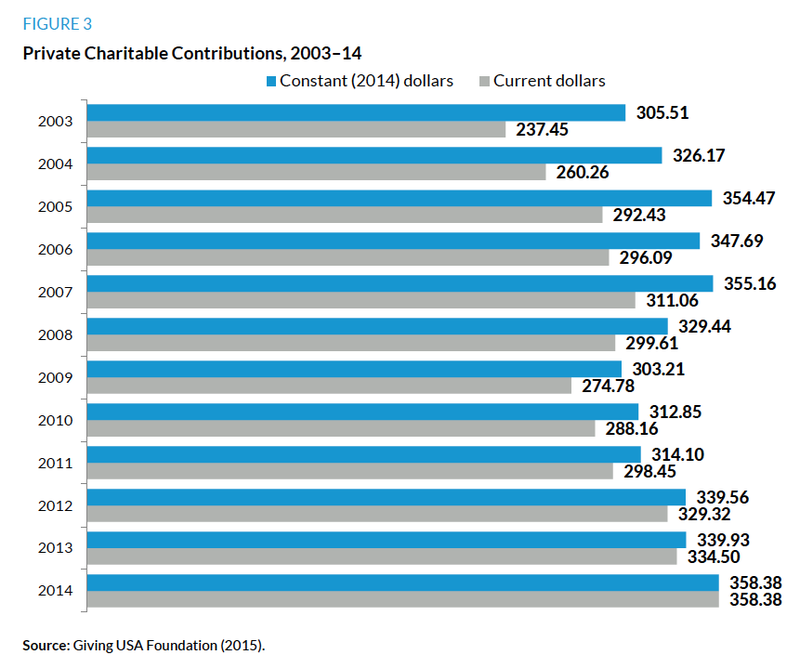 Private charitable contributions reached an estimated $358.38 billion in 2014 (figure 3; Giving USA Foundation 2015). Total charitable giving has been increasing for five consecutive years, beginning with 2010: since 2009, private giving has increased 18.2 percent, adjusting for inflation. Congregations and religious organizations received nearly one-third (32.0 percent) of all charitable contributions in 2014 (table 5), a slightly lower proportion than they received five years earlier in 2009 (33.2 percent). Education organizations received the next-highest share of private charitable contributions (15.2 percent), followed by human services organizations (11.7 percent); both of these types of organizations received a higher proportion of charitable contributions than they had received five years earlier (13.2 percent and 8.9 percent, respectively). Gifts to individuals made up the smallest proportion of private contributions: 1.8 percent. The Foundation Center estimates there were more than 87,142 grantmaking foundations in the United States in 2013 (Foundation Center 2015). Their grants, a component of private charitable contributions, totaled $55.3 billion in 2013, up 5.2 percent from 2012 after adjusting for inflation (figure 4). 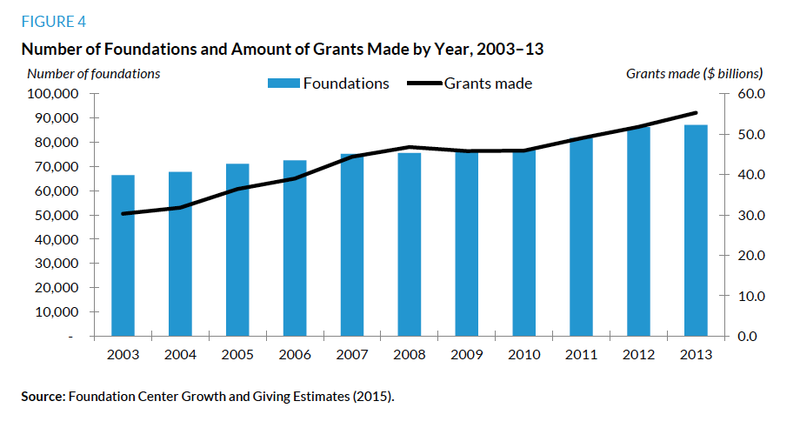 Between 2003 and 2013, foundation grantmaking increased 44.2 percent after adjusting for inflation. Foundation assets also grew over the same period, increasing 32.2 percent from $603.8 billion in 2003 to $798.2 billion in 2013 after adjusting for inflation. An estimated 62.8 million adults, 25.3 percent of the US population, volunteered at least once in 2014. Although the decline from the estimated 2013 volunteer rate of 25.4 percent is statistically insignificant, the 2014 volunteer rate is the lowest reported since 2002. The highest volunteer rate reported since 2002 was 28.8 percent, which was achieved in three consecutive years: 2003, 2004, and 2005. However, estimates also show that although the proportion of the population that volunteers at least once a year declined slightly in 2014, the proportion volunteering on an average day increased. A full 6.4 percent of the population, or 16.0 million people, volunteered on an average day in 2014. This is an increase of almost one million people compared with 2013, and the highest proportion and number of people volunteering on an average day since 2010. The estimated number of volunteers increased only slightly in 2014 (62.8 billion volunteers) compared with 2013 (62.6 billion). However, the number of hours volunteered increased over 5 percent between the two years, from 8.3 billion hours in 2013 to 8.7 billion in 2014. This number of hours is the largest estimated by the Current Population Survey since the volunteer supplement was first implemented in 2002, surpassing the previous peak of 8.5 billion hours in 2012. Volunteers averaged an estimated 139 hours a year in 2014; this number is also a record high. Figure 5 provides more information on how volunteers spent their time in 2014. The largest use of volunteer time in 2014 was working on social service and care activities (23.8 percent). However, this is a slight decline from the 27.5 percent used for such services in 2013. Social service and care activities include preparing food and cleaning up, collecting and delivering clothing or other goods, providing direct care or services, teaching, leading counseling, and mentoring. As had been the case in 2013, in 2014 administrative and support activities represented the second-largest proportion at 23.5 percent of total volunteer time. In 2014 volunteers spent proportionally more time in meetings, conferences, training activities, and travel than in 2013, but less time with cultural activities and maintenance or cleaning activities. 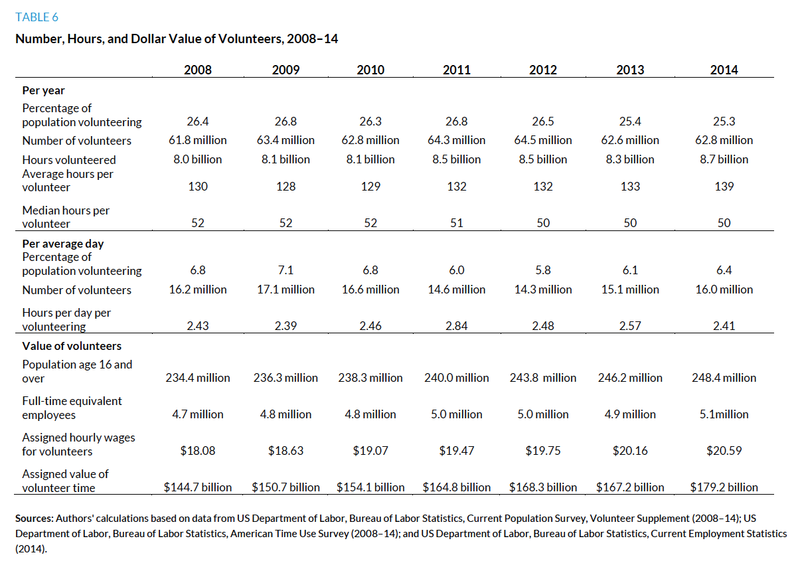 The time volunteers spent in 2014 was worth an estimated $179.2 billion (table 6). The value of volunteer time combined with private giving accounted for over half a trillion dollars ($537.6 billion), and volunteer time represents 33.3 percent of that total. In 2013, public charities composed over two-thirds of all registered nonprofit organizations and accounted for over three-quarters of the revenue and expenses of the nonprofit sector in the United States. The steady growth of the early 2000s slowed between 2008 and 2013 when the recession hit the nonprofit sector; for some subsectors (particularly the international and foreign affairs subsector and the arts, culture, and humanities subsector) financial indicators declined. However, the sector as a whole continues expand, with revenue, expenses, and assets all growing more than 10 percent between 2008 and 2013, after adjusting for inflation. Furthermore, after a low during the recession in 2009, private charitable giving edged upward, growing 5.4 percent from 2013 to 2014 alone (in inflation-adjusted dollars) and peaking at $358.38 billion. This is the fifth consecutive year that charitable giving has risen, and the first to exceed prerecession levels, which peaked in 2007 at $355.16 billion (in 2014 dollars). Volunteering also increased in 2014, with more individuals volunteering than in 2013 and the largest estimated number of volunteer hours (8.7 billion) since the Current Population Survey’s volunteer supplement was implemented in 2002. The standard source for estimates of religious congregations is American Church Lists, a company that provides marketing data using phone listings and other sources. The most recent estimates from American Church Lists suggest there are about 345,000 houses of worship in the United States. Of these, approximately 235,000 are registered with the IRS, according to National Center for Charitable Statistics’s analysis of the July 2015 IRS Business Master File. See “Church Specialty List,” InfoUSA, accessed October 8, 2015, http://www.infousa.com/church-list. All private foundations, regardless of size, are required to file a Form 990-PF. Before tax year 2010, nonprofits with gross receipts of $25,000 or more (excluding religious congregations) were required to file a Form 990 or Form 990-EZ. Beginning in 2010, only organizations with $50,000 or more in gross receipts (excluding religious congregations) were required to file a Form 990 or Form 990-EZ. Organizations with less than $50,000 in gross receipts are required to file an information return known as the Form 990-N (e-Postcard). Filing requirements by year are available at “Which Forms Do Exempt Organizations File?” Internal Revenue Service, accessed October 8, 2015, http://www.irs.gov/charities/article/0,,id=184445,00.html. National Center for Charitable Statistics calculations of IRS Statistics of Income Division Exempt Organizations Sample (2012). As with last year’s edition, the Nonprofit Sector in Brief 2015 relies on data from the Current Population Survey for estimates of number of hours volunteered. These numbers should not be directly compared to those from pre-2014 editions of the brief, which relied on the American Time Use Survey for such estimates and consequently estimated higher numbers. For more on the Current Population Survey, see “Labor Force Statistics from the Current Population Survey,” Bureau of Labor Statistics, accessed October 8, 2015, http://www.bls.gov/cps/home.htm. For more on the American Time Use Survey, see “American Time Use Survey,” Bureau of Labor Statistics, accessed October 8, 2015, http://www.bls.gov/tus/home.htm. Brice S. McKeever is a research associate in the Center on Nonprofits and Philanthropy at the Urban Institute, where he primarily performs quantitative research for the center’s National Center for Charitable Statistics. Among other projects, his work has included a series of briefs on how the Great Recession affected the nonprofit sector; a study on potential predictors of future nonprofit failure; and a longitudinal analysis of arts organizations in six major metropolitan areas as part of a study funded by the National Endowment for the Arts. This brief was funded by the Urban Institute. We are grateful to them and to all our funders, who make it possible for Urban to advance its mission. Funders do not, however, determine our research findings or the insights and recommendations of our experts. The views expressed are those of the author and should not be attributed to the Urban Institute, its trustees, or its funders. Copyright © October 2015. Urban Institute. Permission is granted for reproduction of this file, with attribution to the Urban Institute.